Integrating spheres have been around for decades, many decades. They are the go to solution for measuring divergent light sources. After such a long history, what could be new in integrating spheres? Well, new applications often demand new refinements in veteran technology and integrating spheres are no different. VCSELs, LEDs and other present day light sources are different in that they are physically small and have relatively large divergence angles, but not more than 2pi steradians. These devices are frequently mounted on PCBs that have reflective surfaces. The first challenge in using an integrating sphere is making sure that all the light gets into the sphere. As the divergence angle increases, the thickness of the sphere walls and input port mechanics becomes an issue. The simplest solution is to place the light source very close to a large input port. This leads to the second challenge, making sure that the sphere doesn’t “see” extraneous reflective surfaces that will affect the measurement. Yes, there is a work around with an auxiliary light source, but this is a cumbersome solution. At Ophir, we’ve come up with some new innovations for our IS6 product line to simplify measuring VCSELs and LEDs. In the first, we redesigned our 2.5” to 1” port reducer. The new, low profile design provides a full 120⁰ acceptance angle over the central 6 mm of the aperture. Not an easy task when it has a PTFE reflector. Sure, it’s easy to achieve a wide angle if the port reducer uses barium sulfate paint. But do you really want to use a painted accessory when the sphere itself is made from PTFE? 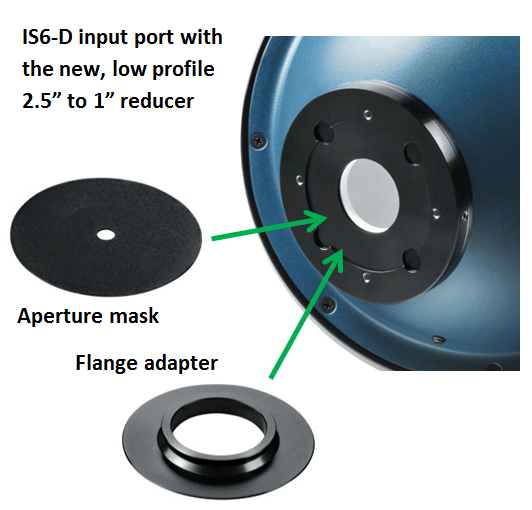 To further increase the functionality of the new port reducer, we’ve added aperture mask accessories to the design. They come in a set of 5, 7 and 10 mm apertures to allow further reduction of the input port to exactly the size required by your application. The masks have a very low reflectance black surface so they don’t have any effect on measurements made with the sphere. The aperture masks are securely held by magnets in a recess that centers them properly. 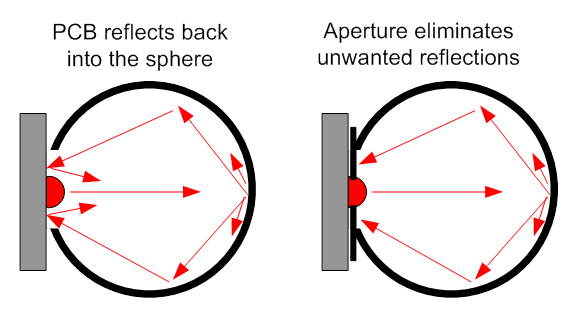 Changing aperture masks is a cinch, snap one out and snap another in. Achieving the wide acceptance angle necessitated removing the dovetail accessory flange. For customers that need this feature we also designed a separate flange accessory that can be screwed down into the same recess that the aperture masks use. For divergence angles even larger than 120⁰ we’ve come up with a new, patent pending design, the IS6-D-IR-170. 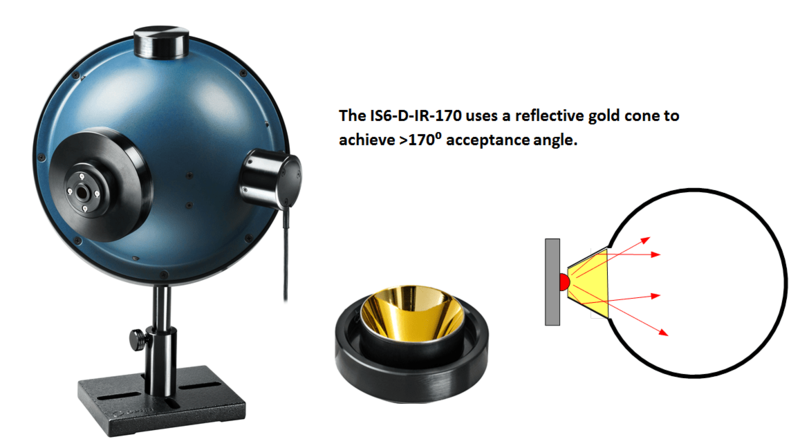 This integrating sphere incorporates a special, gold coated, reflective input port that has an 8 mm entrance aperture with an acceptance angle of almost a complete hemisphere! The spec states “>170⁰” only because it is so difficult to measure beyond that. In practice, the acceptance angle is very close to 180⁰. Obviously, to accept a full 180⁰ of light, the light source needs to be located in the plane of the input port. So the front surface of the input port is made from an insulating material to avoid accidently causing electrical shorts. So when you are measuring VCSEL’s or LEDs, no matter how large your angle, we have it covered. « Find Out Everything You’ve Ever Wanted to Know About Laser and LED Characterization in MKS Instruments’ New Handbook! How Can High Power Laser Measurement Sensors (1-10KW) Be Calibrated By Laser Measurement Vendors? Bottom Line: What Is Beam Profiling Dynamic Range?